Six years ago we started a blog with our grandmother, Bubby, as a way to share her wise advice with the world. We knew that everyone would love her wit, candor and compassion. This little experiment soon turned into something more special than we could have ever imagined. Within months, Bubby was receiving letters from thousands of people around the world, pouring out their hearts, and sharing their most personal stories with our grandmother. She loved offering her help. She loved reading your letters every day. She was so proud to be a Bubby to all of you. Sadly, last night, we lost our Bubby. At 94, she was still beautiful. Thank you for all of your contributions over the years. You helped make her life that much more special. In July of 2006, we received a letter from a 29-year old woman with a broken heart. And this wasn't the first time she had to pick up the pieces. She and her fiance were supposed to be married in 2005, but he called it off and they parted ways. 6 months later he found his way back to her, begged for forgiveness, re-proposed, and she accepted. A few months went by and he called off the wedding again. But of course he kept her dangling and her hopes for a third reunion remained high. When you hear a story like this, you want to yell from the rooftops, "FORGET HIM!" But as we all know, the heart can be hard-of-hearing sometimes. And this girl needed some advice. Leave it to Bubby to set things straight. Bubby wasted no time referring to this man as an "immature fellow." She wrote, "I recommend you forget him and if he calls, just tell him the party is over... There are many fish in the sea and I am sure there is one who is looking for you... Life with this person will never happen. I wish you all the happiness in the world." Even an anonymous commenter left a note saying: "Bubby's quite right. If he breaks it off once, and comes back, and all's well, fine. We all make mistakes, and we all have doubts. If he breaks it off twice?! Run, and never look back." There is nothing we love more at this website than an update letter with a happy ending. So we are pleased to report that nearly 3 years to the date of this original posting, we heard from this woman again. I wanted to write to up-date you and to thank you for the very good advice you gave me some three years ago now. My then fiance had called off our wedding for the second time and I was so distressed. You said I should forget this immature person who had wasted so much of my time. I took your advice and it really really worked out! After deciding to end all contact with my ex-fiance, I worked hard on my career and found a fantastic new job. The very first month I met a colleague in another department and, in time, we fell in love. We married last year and are now expecting our first child. With my ex, everything was difficult. With my now husband, everything is easy - we can really talk and he is so kind, fun and gentle. And, he was, from the beginning, absolutely sure about me. He is also supportive of my career as we work in the same field, something my ex never was. Really, he just cares deeply about my happiness and I couldn't imagine that I could ever love someone as much as I love him. I never would have found this wonderful man if I hadn't taken your advice. Anyway, just to thank you. Writing to you and receiving your sensible response was a great comfort to me then, and I am so grateful I listened to your wisdom. Children ask, "On this night, why...?" Than to have Bubby make your seder plate. April 24, 2005: 32 people around the table! April 25, 2005: Noodle Yummy on Passover? June 22, 2005: Why 8 days? What an historic day! Bubby couldn't be more pleased to see Barack Obama become our new president. She was glued to CNN just like the rest of the world. Can you imagine how it must feel to be 93 and see such a pivotal moment in history?? To commemorate the day, we decided to remind you of some great letters Bubby has responded to over the years that were related to politics. and overdose on panic and fear. "Don't forget. Money is round... It can roll towards you, or away." Here are some of the best "money questions" Bubby has responded to over the years. How can I retire and still take care of everyone? If I stayed in India I would have no money problems! Another year has gone by... Another birthday is here to celebrate. Post your birthday wishes to Bubby in the comments below. Bubby and her granddaughters wish all of you a happy and healthy new year. Over the years we have received so many (thousands!) of touching, endearing, tearful, hopeful, soulful letters from people around the world, asking Bubby for life advice. We wish for all of you that your stories turn out happy and everyone sees all their dreams come true. And on that note, how 'bout a happy update letter! On July 25, 2005, we received a letter from a 25-year old woman living in Belgium who told Bubby she was planning to marry her boyfriend. She was looking for her first job after graduate school, but the only one available to her was far away in Paris. She wasn't excited about the job and didn't feel like it matched her qualifications. But she was afraid her parents would be mad if she didn't accept it. Bubby wrote her wisely, "It is a terrible feeling to get up in the morning and go to a job that you don't like or are not qualified for. Just give yourself more time to find the job for which you are trained and you are qualified." And then she added, "Don't worry about your boyfriend. If you really love one another distance will not make a difference." Bubby knows what long-distance love is like! And she knew there was a way to solve this problem if everyone sat down to talk about it. "Put your thinking cap on!" Bubby told her. A few years went by, and on March 8, 2006, we received a great update letter. They were still happily in love and getting married! She did find another job that she was much happier with, even though it still meant geographical distance for the couple. But they visited each other every weekend, and spoke on the phone every day. She wrote, "This is working, because we made it work, with lots of patience and love. Thanks for your nice advice to me when I asked for it... I'll send you another update for the wedding." I am very happy to tell you that, due to my good job and good fortune, he was able to come join me in Paris to look for a job (which he found easily). We got married in April. We first met in 2003, and it was a difficult 5 years. We got through it, partly thanks to your advice. So thank you very much and take care. Your site is a great idea and your acts are beautiful mitzvos. You have my admiration always for helping these people in your special way. Blessings. I would like to congratulate you on a successful and ingenious site :) I'm a newcomer but I'm impressed with the layout and content. It's very nice of you to want to help those in need of advice. New Letters and New Advice! Bubby had some special help from her own daughter to answer this new letter. I'm a 17 year old girl and a senior in high school. I am a member of the softball team and this year I've been named captain! This past Sunday something I never could have imagined happened... our assistant coach past away. The whole team is devastated. It was very sudden, he wasn't even sick. Now, every time our head coach looks at the team, he gets tears in his eyes. As the captain, I feel it's my job to keep everyone in high spirit. I put on a brave face and act like everything's OK, but I just can't do it anymore. I need a shoulder to cry on too. What can I say to my teammates to help them cope with this great lost without lying to myself? How can I help my head coach deal with losing his best friend? Every person should allow for time to mourn. It's a very human need. You need to be patient with yourself. It's very kind of you to want to help your team. In time, everyone's spirits will be revived and the memory of your coach will celebrated in team victories. But for now, take time to cry, talk about your feeling, and share them with your teammates. Even if you tell them that "Everything is OK", it's all right to admit that it isn't right now. Maybe you guys can do something in his honor, like raise money to help his family, or have a memorial service, or a candlelight vigil. Maybe everyone can share stories about him. There is a time for mourning, and a time for smiling. That's so nice to read your advices. We always need advice in our life and sometimes get lost with what we should do in our life, especially when we're thinking alone. I really thank you for all what you do to help people. so nice! Good luck & take care! I am 30 years old. I am Muslim and live in an Arabian country. I suffer a lot because I'm homosexual. I hate that but I do not know how to change and be normal. I want to marry and get children. Is there hope? Is there methods or cure for my case? Please help, sorry for my bad English. I suggest you move to a country that is more tolerant so that you can have a life. A happy life. Homosexuality is not a disease, you are just born that way. It doesn't mean that something is wrong with you. People who are not educated well enough don't know how to be more accepting. Start accepting yourself first. You can still have a family and children, just maybe not where you are living now. I'd really really appreciate it if you gave me your wonderful advice on this particular situation that I'm in. I am sure that you get a ton of email from people around the world - but it would be amazing to get feedback from such a great lady. Fortunately for some—and unfortunately for others in high school, the junior prom is just around the corner. I know it's just one night and essentially just another school dance, but with added stress and more hype. (It all seems so shallow yet fun to me). I have the dress. I have the group of friends I'm going with. Just missing is my date. Nervous to the point that I almost couldn't think, I asked a friend (who is a senior) to the prom, as friends. He was very kind about it... but said he couldn't go because he was visiting his sister somewhere. He told me "thanks for the invite" and suggested that I ask one of his friends. Wow. This was like a small slap in the face. But it's life. And it happens. Unfortunately one of my friends (a girl) had already asked (the senior's) friend. Pretty much all of my girl friends have dates and I know it is my fault that I waited too long to ask that senior in the first place. But along comes fate. In the face of a guy, who I'll call Joe, and who is looking for a date. I hear that he is planning on asking me. It is so exciting that someone is going to ask me to prom, but I don't really like Joe like a boyfriend...like I'm not attracted to him at all. He's not that bad looking, just really annoying sometimes. I hate to sound to shallow mean but I care too much about what other girls in my school would say and think. (Like "Oh she's too good for him" Or "she shouldn't settle"). But I begin thinking that maybe all this stupid drama would not have happened if I had had a boyfriend. Maybe none of this rejection and awkwardness would not have occurred. Maybe there's something wrong with me or something I did or did not do that causes me not to have a boyfriend. I have lots of friends (guys and girls) in school and am active in many clubs and sports. I try (but not too hard) to be outgoing and positive but it seems all very fruitless at the moment. So what went wrong? Will I ever find not just someone who I like, but some who likes me back? And is finding a boyfriend this hard in college? I hope not. Please Bubby, could you respond to my incredibly long email? Pretty please? And thanks so much for your time. I found it and so will you. You never know where love will find you or you will find love. Bubby had some help from some special people to answer a ton of new mail she's received lately. Check back all week to read more of Bubby's advice. I am 15, turning 16. I know I'm young but it is believed I am an "old soul". I believe in a lot of things the people around me don't even consider. However, I am haunted by a dark childhood. Many things have happened to me one of which has ripped me apart from my best friend, my mother. We have been apart for 3 years now with visits once or twice a week but it's not enough ever. I have also been lost in interest. I used to do ballet, soccer, paint, write, read, everything. And the past two years have been empty of it, not because of lack of opportunity, but lack of interest. I am frustrated because I do not even have anything to lose myself in or vent through. I've been trying everything from belly dancing to guitar lessons and nothing seems to help. Everyone says it's gonna get better. They've been saying it since I was born. I'm tired of waiting Bubby! This will pass. And you are going to look back at the dark side of your life and you will be in control. In a few years you will be an adult and you will be able to make decisions and spend more time with your mother. Just hold on to it. It's going to be OK.
You are a very, very strong young girl with a lot of interests and a nice future. Keep taking advantage of all of your opportunities. This is just for now, but the future is up to you. Today Bubby had a great day with some special visitors. We all gathered together on the couch to answer some new letters. Check back all week to read more of Bubby's advice. I've been asking my friends this question and been coming up with the same answer, but I wanted an outside opinion. I can't feel like I can really talk to my parents. And my grandparents aren't around anymore. I want to be an animator. I'm very serious and passionate about art and this career choice. But my dad just doesn't seem to see that. I wish he could understand how I feel about what I do, but he doesn't. Recently I've been talking to him about the idea of college, and I told him of this wonderful college outside of the state. He got really mad. He told me that he wasn't going to send me money outside of the state, because he didn't think I could handle the responsibility. I have an autistic brother that my mom and I take care of and my dad doesn't help at all. I do a lot around here, and get decent grades in school. I don't understand why he wouldn't think I'm responsible enough. I'd do anything to get my dad's approval and lately I've been thinking of doing something else so that he's happy and proud of me. Should I go through with not pursuing my career as an animator? You should try to explain to your father what an animator does and show him examples of your work. Maybe once he knows what it entails, he'll learn to respect you and the work that you love to do. Find out exactly what he has against being an animator. Maybe he thinks you can't earn a living doing that. Tell him about people who work at Disney - they make a lot of money! Get your education first. You're still young. You should explore all possibilities. If you are interested in art, then pursue a career in art. Just like my granddaughter. Joan Rivers: "And what are you wearing tonight?" Natalie Portman: "Oh, this is an original 'Help Me, Bubby!' t-shirt I bought at cafepress, thanks to my favorite blog." Joan Rivers: "It's fabulous. I'm kvelling over it. Melissa, get one of these for my grand kids! I want to be hearted, too." Just in time of Oscar season, we have three new items in the marketplace today! Click here to visit. If you've purchased one of our items before (and we know tons of you have! ), take a photo of yourself or someone else wearing the item, and email it to us. We'll feature you on Bubby's website...! It's amazing to me that most Jewish people here don't know what a bubby is and call their grandmother's - grandma. It's amazing what you are doing with the blog. Thanks, Michael! 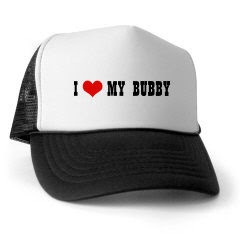 This reminds us of a post we put up in July of 2006, regarding Bubby's yiddish moniker. Lots of people ask us about her name. Click here for a refresher on the meaning. I've been reading your old letters, and I came across one that inspired me. Lost Seeker [Monday, August 28 2007] sounds a lot like me. I feel the exact same way as him. I was uninspired when I graduated, and have yet to pick a direction. I am also wondering about love, but that's another story. I was actually wondering if I could find out how he's doing now? If he went in a particular direction? Maybe his story can help me. Could you ask me if he could give me some pointers? He just sounds like someone I'd like to speak to. We've reposted the letter she is reffering to below. And of course, we've already sent a note asking our reader for a follow-up! Check back soon to see his reply. First I want to say that I think your website is wonderful! It's beautiful to see you lovingly helping so many people out there!! If only there were more people like you out there. I send out much love to you!!! I'm a 22-year-old male, and for the past 6 years I have been feeling more and more lost in life. I just finished college, majoring in science, and although I loved it at first, I ended college with no interest to pursue a career in the subject. I thought by this point in life, I would have my life sorted out a little more. Most people I know have figured out what they want to do with themselves, they know what type of occupation they want, and they are in long term relationships. Here I am, with no real direction in life, have never had a solid relationship, and no sure sign of one happening soon (or ever). I've decided to take a year to travel around. I spent 2 months living in Spain, and will be returning to Europe shortly. I'm hoping that travel will help me learn a lot more about the world, about people, and about myself. And hopefully it will help me find some direction. My question is: Does direction in life ever come?? How exactly does one find it? My current plan is to wander the planet until I find it. And true love? Does it really exist? Is there really a soul mate for everyone? Does life ever come together? I really need the advice of somebody who has been in the world long enough to know the nature of it better than I do. I think maybe you don't give yourself enough time wherever it is you go. You should put down roots and get to know the people around you. Take a job where there are lots of people. Maybe a large corporation. And you'll learn to deal with different personalities. Some will be good, some bad, some will have expectations and others will never get off the ground. And you should learn the difference. Yes, there is a true soul mate. And you will find that it will find you. And one day without hunting, she'll be there. I know. Because I went through it. Just wait and see. True love will come. While we're waiting for Bubby to return, we thought we'd pose a question to you. Get the conversation started by posting in the comments below. If someone you are dating tells you that they have been writing a blog about the details of their dating life since long before they met you, would you want to read it? She's doing great! She still can't quite make it to her computer at this moment, so we are relying on alternative ways of getting her feedback onto the website (like hand-written notes, and audio recordings). So forgive the delay in posting. But she sends her regards to everyone, and says she is delighted to hear that you all still check her website daily. And, yes, we know all the images aren't showing up here as they usually do. We are having some technical difficulties with our hosting company, and expect to resolve that shortly. Bubby wanted to say hello to everyone and let you know how she's doing. She thanks you all for those kind birthday wishes (she's 91 now!) and has lots to say below. We continue to receive letters from everyone around the world on a daily basis and the stories that you share with us are truly touching. Thank you so much. Since Bubby couldn't possibly respond to the hundreds of letters waiting her reply in her inbox (did we mention she's 91? ), she thought she'd offer some generalized advice that speak to the issues most of you write to her about. For a long time I wasn’t well and was not able to get back to my friends through out the country. But now I’m feeling better and I want to acknowledge all my friends who are so kind to write to me. And I wish them all well. And I hope they will continue to write and tell me about all the things they have been doing. I’m feeling much better and I’ve been spending my time knitting a lot of scarves. First of all, you must love what you are doing. And you must decide what it is best for you. What interests you most? Because when you know what your interests are, you can develop a career. If you like to write, write a book. It can be a review of history, a love story, or a travel log from a vacation that you have had. When you have a difference with anyone in the family, don’t stop talking to them. Your anger just grows and grows. If you have a difference with a family member, you call that person and you talk it over. Because every problem has a solution. You don’t spend money you don’t have. Put it this way: You can charge. And when you get money at the end of the month, you pay all your bills. If you don’t pay all your bills one month, you have twice as many to pay the next month. Well, there are several ways of approaching religion. There are some people that are ultra religious, and there are a lot of do’s and don’ts. You must thank God for all the good things and be tolerant of all the sad things that happen in a life time. My roommate was with me. And she said afterwards, that my eyes sparkled like a flirt. I was embarrassed. And then it was time for him to go to the station. He missed one train. And then he missed another train. And then we had to go because there was only one more train to New York . And we walked him to the station, and he said, “Is it OK if I write to you? Will you answer me?” And I said, “If you want to.” And then the next day I got a letter. And then day after, I got another letter. And the day after, I got another letter. And everyday I got a letter from him. 215 letters. I think I still have a couple. So I answered him. But if I skipped a day, he would call me. Then my father told me he didn’t like him. So I wrote him a letter. I wrote: “Don’t write to me anymore. Because my father told me I should break it off with you. So you have to forget about me. I must listen to my father. He pays my tuition.” But he wouldn’t take no for an answer. And we were married by his father, a rabbi. Make sure that in your heart it tells you that this is the one. Or not. And he was the one. Because he was very, very kind. And he helped me in every way that he could. He went to school at night, worked during the day. He was a very good husband. When my son was born, he helped me. He made the funniest diapers. He put the diaper on, and as soon as you picked the baby up, they fell off. I remember sitting in the hospital all day and all night. When he died, he died in my arms. Life is what you make it. It can be happy or sad. But to be good it must be one of joy and happiness. Because every person has happiness in his soul. And if you keep thinking sad things, you are a sad person. So be happy. And life will be good to you. Everyday should be filled with sunshine and the sun follows the rain. The earth is cleansed. "If you want to read a good book, full of joy and good health and happiness, I recommend this book, especially if you are sad. And lonely. Reading this book will bring you joy and happiness. Joy and happiness will bring you good health. If you want to see some joy and fun, you must look at the cartoons made by my granddaughter. They are available on the Internet." Bubby's birthday is coming up in a week and she'll be 91 years old! Use the comment box below to post your birthday messages to Bubby, and we'll make sure she reads them all. In the meantime, we're re-posting a letter someone sent to Bubby back in July of 2004. And yes, it has to do with birthdays. My husband forgot my birthday this year. Should I also forget his? I know how you feel to be forgotten on your birthday by your husband but two wrongs do not make a right. I would send him a card with nothing on it for one thing and a gift box with nothing in it. And if he says anything I would remind him of what he did to me. And then I would say that now that we have both had our says -- Let's go out and celebrate for both of us. And I bet next year he will not forget at all. Have a good time. Remember, there are forgetful moments in every life time. Let this be the last in yours. Bubby sends her best to everyone and maybe soon she can put together a little message for you all. But in the meantime, she's resting up, and you're all moving on with your lives. We know that, because, you send us Update Letters! And we love 'em. So here's a new one (keep sending them in, please! According to our poll, it's one of your favorite parts of this site). But when a girl thinks about those things, A LOT, and the boyfriend does not think about those things, like, EVER... Well, a girl starts to get upset. And a girl writes to Bubby asking what she should do. And Bubby writes back, saying, "Don't push it. If you push it, it will be over. Young men are fragile. Be smart, and you will win." Thank you for giving me that wisely advice. Just 2 months after my first email to you, I made a horrible decision and I had to put an end to this fatal hesitation because I was in a very bad situation mentally, so I disclosed my expectations to my boyfriend and finally I told him I had spent enough time with him and had wanted to plan for the rest of my life with him. I mentioned my purpose in an indirect manner, but he told me he never had any plan to marry neither me nor any other girl because he was very conservative person and feared from responsibility and also very career oriented and didn't think about getting married. how can I believe that I invested my time, my energy and my emotion for him without any good result that I desired? I know the best thing to do is to walk away and get along with my own life. I know I can't endear my self to him any more. By the way your blog is fantastic, I read it everyday and enjoy your nice advices. Despite I never see your lovely face, I know I always have a very especial and positive feeling toward you. Sounds like "Upset Girl" made a bold decision and asked him to step aside herself. But, she still sounds so Upset. Can any of you offer her some advice in the Comments box below so she cheers up? Sorry for the lack of posts and activity on the site for a while. Bubby is OK, just not up to writing lately (supposedly you're allowed to "take it easy" in life once you turn 90!). She still loves hearing from all of you, and receiving such warm accolades about the work she's done on this site for over 4 years! On September 17, 2005, we posted a letter from a young girl called, "Ready to Change". She wrote to Bubby with a sad heart. Only in 9th grade, she was nearly 200 pounds. She wanted to be healthy, she wanted to stay motivated to loose the weight, she wanted to stop feeling jealous of "skinny people". But it was tough. She asked Bubby what she should do. Bubby is quite a health-conscious grandma, and quickly told our young reader that she should go see a nutritionist. She wrote, "He or she will take some tests and put you on a very special diet. You MUST follow it implicitly." She warned our reader about the health risks of her condition such as high blood pressure, or diabetes. Bubby concluded, "If you want to live to a right old age you must take care of yourself now... You will be able to enjoy life as you should at your age." We were so happy to hear from Ready To Change one year later. She had a wonderful update to share with everyone. I sent you a letter over a year ago, going into ninth grade. At the time I felt really fat, and unloved. After getting your reply, I joined the swim team. I absolutely loved that experience. I wasn't a varsity swimmer, but I learned to develop my swimming skills. Our team was first in our league that year. That school year I was the editor for my school yearbook and on the National Honor Society executive board. It was so fun interacting with all these athletes from my school (the school that I go to is really big on sports) while working on the yearbook and knowing that I was an athlete too. Then, in the spring I took a risk and joined the high school Water Polo team. Water polo is my favorite sport, it is such an intense, fun game. Near the end of the season, I took up running. I felt so powerful and in control. I wouldn't have done that last year, but I love running now. Now I am back on the swim team, and I'm really only a couple of seconds away from varsity. I love myself, and I love hanging out with others. I feel like my life has made a huge change since then. What a wonderful inspirational update. Thank YOU!